Wenjun Zhou is currently an Associate Professor at the Department of Business Analytics and Statistics (BAS), Haslam College of Business (HCB), the University of Tennessee Knoxville (UTK). She received her Ph.D. degree from Rutgers University. She has a M.S. degree from the University of Michigan-Ann Arbor, and a B.S. degree from the University of Science and Technology of China. 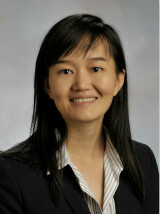 Dr. Zhou's general research interests are data mining, business analytics, and statistical computing. She has published prolifically in refereed journals and conference proceedings, such as Machine Learning, INFORMS Journal on Computing, IEEE Transactions on Knowledge and Data Engineering (TKDE), European Journal of Operational Research (EJOR), ACM SIGKDD International Conference on Knowledge Discovery and Data Mining (KDD), and IEEE International Conference on Data Mining (ICDM). Dr. Zhou was nominated Roy & Audrey Fancher Faculty Research Fellow in 2017 and R. Stanley Bowden II Faculty Research Fellow in 2016. She is the recipient of the Best Paper Award at WAIM 2013, Best Student Paper Runner-Up Award at KDD 2008, Best Paper Runner-Up Award at ICTAI 2006. She was among the top five finalists for ACM SIGKDD Doctoral Dissertation Award in 2011. Dr. Zhou has served on NSF review panels and program committees of top international conferences, including KDD, ICDM, and SDM. She is a senior member of ACM and IEEE, and a member of INFORMS. © 2018 Wenjun Zhou. All rights reserved.